If you’re planning a long-distance motorcycle ride in the near future, then you’ll appreciate these tips which we compiled after taking multi-day trips on our Harley. Whenever possible, try to find a hotel that’s in walking distance to a restaurant/bar so you don’t have to get back on the bike before you turn in for the night. Eat very light for breakfast, then eat an early lunch before the lunch crowd arrives. If you’re going to eat a heavy meal or a lot of food, save it for the last meal of the day when you’re done riding — because big meals take a lot of energy to digest and will make you drowsy. Don’t eat at chain restaurants. Instead, stop at mom & pop restaurants and local pubs whenever possible. (The hole-in-the-wall dives have much more character, and you learn a lot more about the people and things to do in the area.) For example, we stopped at a small pub in Crossville, TN called Cowgirls Sports Bar & Grille for a burger. We met the bar’s owner and learned about an unadvertised show featuring a very famous Country Music star who is going to unveil a new band he’s promoting there in a few weeks. Pack snacks if you have the space. We like snack-size peanut M&Ms, hard candies (like Sweet Tarts, Gobstoppers, Jolly Ranchers), and mixed nuts in snack-size ziploc bags. Carry water and make a point to drink some every time you stop (even if you don’t feel thirsty). It’s important to your alertness and your overall comfort level to stay hydrated. We like to start the trip with a frozen bottle of water. It lasts a long time. Some like to use a Camelbak Hydration Pack instead, so you don’t have to stop in order to get a drink. We had a cigarette lighter accessory installed in one of our saddlebags. That’s how we charge the battery in our mobile phone while we’re riding. We also carry a travel power adaptor so we can use the same phone charger in hotels using an electrical outlet. Even if you only remotely want to see something, then STOP! Enjoy the ride and everything there is to see and do along the way. Otherwise, you’ll be wishing you had if you didn’t. 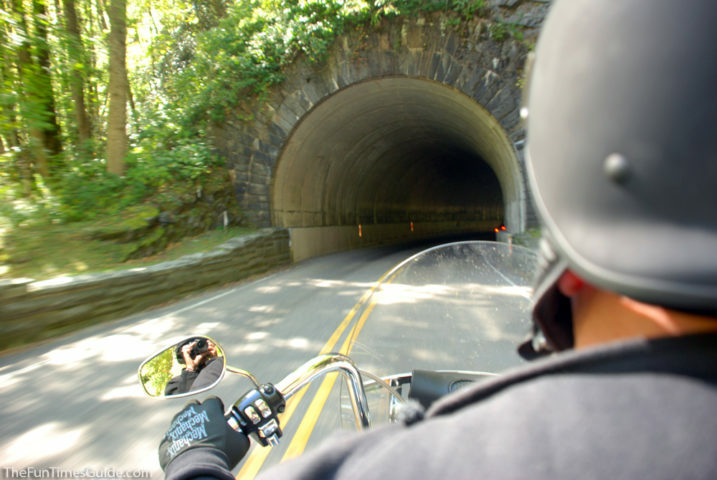 It helps to find places ahead of time by searching online or viewing other motorcyclists’ itineraries (on the map sites mentioned earlier). To avoid having to keep unfolding then refolding the map while on the bike, I sometimes use an app called CamScanner to take a photo of the exact portion of the map we are most interested in for that particular leg of the trip. That way, we can just zoom in to the “photo” of the map that is stored on our phone in order to see things on the map even closer while we are on the bike. The app produces higher quality and more detailed images than a typical camera app. It turns your phone into a photocopy scanner and stores images as PDF’s which you can then save, share, or upload to the cloud. Take a photo at each and every stop — including state lines, historic roadways, and noteworthy locations. Try to take a group photo at the start of each day. We keep a small pair of binoculars in the front pocket of the luggage. They could come in handy to see what’s up ahead of you on the road or to view wildlife in the distance. We haven’t invested in motorcycle glasses for riding at night yet. Instead, we each wear a cheap pair of clear lens safety glasses during our nighttime rides. On chilly or windy days, I wear clear silicone earplugs to keep the wind from entering my ears since I’m prone to ear aches. Like many people, I photograph everything we do in life and I document those things in scrapbooks and online. 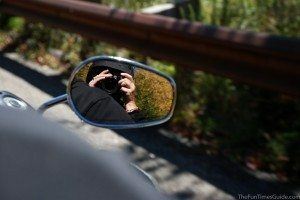 I never thought I’d be able to take my Nikon D80 digital camera with me on the bike, but I just couldn’t head out on our first long-distance motorcycle trip without it. Most of the time, I draped the thick camera strap around my neck and loosely held the camera near my body while it rested on my leg. Other times, I simply used my mobile phone’s camera to point & shoot things we saw whenever we stopped. UPDATE: I’ve since found the best motorcycle camera ever! Here’s my review of the Canon Powershot Elph. We learned the hard way that many places — especially little towns — don’t take American Express. So plan ahead. Have plenty of cash (or a debit card) available instead. Other things that could come in handy and might be worth making room for: 2 bungee cords, a roll of duct tape, kickstand pad (for parking on grass/sand/gravel/asphalt), fanny pack or waist bag (I got one of these; I like how it hooks right on my belt loops), non-cycling shoes & clothing (if your trip requires it), shampoo, and soap (if not staying at a hotel). For keeping the motorcycle clean, we borrowed an amazing product from a friend called Fastwax FW1 Wash & Wax. It’s a waterless car wash that is an aerosol foam. It works great, but it’s expensive! We searched all over for another aerosol foam waterless car wash & wax product, but they are next to impossible to find in stores. Finally, we found Foamtek waterless car wash. It works just as well as the FW1, but costs much less. We highly recommend it! We have lots more fun Motorcycling Tips & Adventures and an awesome Motorcycling Pinterest Board with unique ideas, tips, and motorcycle pictures from around the web!